119 Ministries is the Hebrew Roots ministry of Jon Sherman and Steve Moutria. They teach Bible prophecy including the four blood moons theory in their Daniel Unsealed video. As with other Hebrew Roots groups, many Christians consider 119 ministries a cult. Rabbi Judah ben Samuel’s Jubilee Prophecy – Messiah in 2017? Rabbi Judah ben Samuel supposedly made an amazing prophecy concerning the future of Jerusalem that already has three accurate fulfillments from 1517-1967. 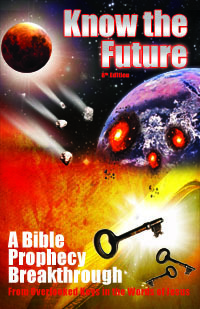 The prophecy further predicts the start of the “Messianic end time” by 2017. But is the prophecy trustworthy and can Jesus even return in 2017? Read on to learn why how people interpret and use this prophecy is flawed. Also, what did Jesus himself reveal as the signs of his coming to watch for…instead of date watching? Comet ISON in 2013: Nibiru Doomsday or Omen of Christ’s Return? When is a comet not just a comet, but a divine warning sign like Jesus spoke of coming in the end times? If you do not know how to answer that, Comet “ISON” may test you with fear and anxiety in 2013. Doomsday watchers are already predicting that Comet ISON is Planet X, Nibiru, Wormwood, or a gravitational earthquake/deep impact threat. Alternatively, some predict it will make a spectacular daytime visible sign in the sky one month before Christ’s return (yes, on Christmas, 2013). Is Comet ISON a good or bad sign, Nibiru, Wormwood or a fulfillment of some other Bible prophecy? Find out how to tell when a comet is just a comet and what must come before Wormwood and other things Jesus warned about come upon us. Are there “signs of the end times” that we are supposed to watch for? Have some already happened or are signs happening now? What if we miss these signs? How do we know if all the “end time signs” hype is correct, that the end times have begun and if Jesus’ coming is really near? Find out how to discern these signs and to better recognize the few true signs that the Bible does talk about us witnessing in the end times. If you produce and sell anything on the Bible such as a book, Bible software, or even a Bible version, you may be surprised to find that you that some Christians will make it a point to tell you how wrong you are to charge for it—because Jesus or Paul or the prophets did not charge for their teaching. But is this what Jesus or Paul taught, that anything associated with the Bible must be given away? Let’s look at the arguments and actual verses that apply to find the surprising truth.